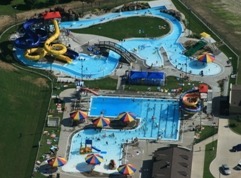 Pella Aquatics provides year-round programming for the city's Indoor Pool and summer programming for the Aquatic Center and the Adventure River. View upcoming events held at the Pella Aquatic Center. View fees for passes and daily admission. *All passes are non-refundable and non-transferable. Year passes allow for admittance into the outdoor and indoor facility, 3 month passes are for indoor only, Summer passes allow for admittance into the outdoor facility and expire on the last day of summer season. The Pella Aquatic Center is enhancing quality of life through sustainable community resources and services. The facility offers swimming lessons*, lap swim, recreation swim team, exercise classes, and open swim times. Below are the links to more information that the facility offers. *The Pella Aquatic Centers does not offer private swimming lessons however group lessons are offered several times per year.